Strangers, Babies is one of those productions that critics either dread or jump at; it’s an undeniably “artistic” staging, with each of its five scenes taking place in a different installation in the spacious Artscape Sandbox, forcing the audience to move through the space with the action. It’s also very dense in its script, with Linda McLean’s text playing with metaphor, simile and emotion to create characters that feel alive and yet crafted for a purpose. Experiencing Strangers, Babies is to experience something that feels like a textbook definition of “artistic”, and with it comes all the benefits and negatives with that label. One benefit is the simple experience. This is a piece that has to be seen to truly appreciate. No review can give a reasonable breakdown of the plot, characters or even the sets as each of those becomes a personal experience for the viewer, their own perspective influencing how they see the show. Did they sit down at one of the benches present in most of the installations? Did they stand? Were they close to the action or far away? Did they only see the face of one of the performers during a scene? All of these things can adjust or influence how the show is interpreted and that’s not even counting personal worldview in how characters are approached by the audience. It’s a heady experience and one that had me thinking all the way home about how I felt about the show. At its core, Strangers, Babies explores society’s response to heinous actions of the past and whether a perpetrator can be forgiven by society as a whole. Like I said, heavy subject matter. 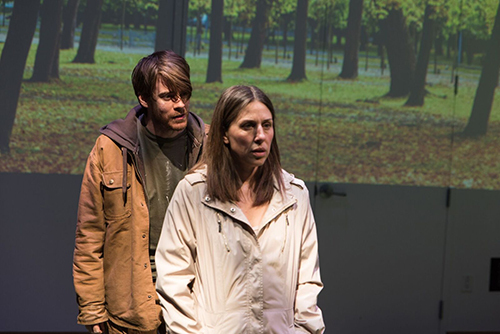 The play tries very hard to not make a statement on its own beliefs, simply laying out the characters, hinting at the crimes committed, and leaving it up to the audience to make their decision. The negatives I mentioned start to rear their head when this begins to come to the forefront; on multiple occasions I found myself mentally wandering away from the action on stage, instead of diving down a tangential rabbit hole a staging choice or script choice created for me. The most glaring example of this was the final scene where May (played wonderfully by Niki Landau) is getting a spot check from a social worker. The scene takes place in an enclosed box with the audience standing outside looking in. An intriguing staging choice, but the mise en scene got me mulling over the idea of the Panopticon which I’ll admit led to me missing a big chunk of dialogue. I genuinely hope this was an intentional result of the production (the Panopticon comparison, not me zoning out) as I thought the choice was inspired, but it did create that “Ah yes, I am watching art and must now dissect its influence and meaning” thought process that can sometimes make “art” hard to approach. There is a lot of care in this production and everyone has clearly put time and effort into creating a fully realized experience. Special mention has to be given to Michael Gianfrancesco who designed the sets; they are minimal and yet immediately approachable, feeling at once like a set and a gallery piece which frames the actors’ performances perfectly. I really enjoyed Strangers, Babies. It was a unique experience that I’m probably going to be talking about for a while, not only because of its subject matter but also the creative effort behind it. If you’re looking for something new that goes outside what we think of traditional theatre, I highly recommend checking it out.